Consistency is the word that comes to mind at the sight of a professional caring management team. With a building that never closes its doors to live-in tenants and visitors, only an excellent Maintenance Program can guarantee you consistent and trouble free service. If you have problems with your maintenance and janitorial services, then contacting BiView is a must. We can design the appropriate service program for your condominium needs, by utilizing properly trained personnel and implementing maintenance programs designed to give you reliable top quality service. Biview will ensure you get trouble free service and an up to date inspection report of your property regularly. With thousands of visitors passing through your building every month, the appearance and appeals of your property will be noted and remembered. A beautiful clean building invites the return of guests, customers, and potential business clients. It is also a clear indicator of a professional and caring Management team! Whether you have a small office or a large building complex, you can trust BiView! We will ensure your entrance glass is sparkling clean, floors buffed to a brilliant shine and your carpets, furniture, and appliances, etc. will be spotless. Your washrooms will be cleaned and sanitized. While a good first impression invites people in, we believe that a well-maintained building is what truly impresses people. We strive for consistency. Absolutely no dust, dirt, or wax build-up in corners, baseboards or other hard to reach areas. Window frames and garbage disposals will be washed and disinfected on a regular basis. Spots and stains will be removed from walls, furniture, and carpets, etc. upon detection. Stairwells will be clean and remain fresh. By utilizing state of the art equipment, quality chemicals and supplies and a unique maintenance program that is second to none in quality control. We can assure you of our persistent quality and trouble free services. BiView Building Service Ltd. has built a reputation for reliable, consistent and high quality service. BiView is your one stop source for a wide range of buildings services. We are the solution for all your building’s needs. We employ highly skilled, qualified and certified Superintendents that are ready to handle all your service requirements. All of our Superintendents have acquired their fire code license, WHMIS certificate, Tenant’s Act Certificate and Building Inspection Certificate. They have the knowledge and the experience in minor plumbing, building repair, boiler room systems, mechanical and electrical systems. The Superintendent is directly responsible for the maintenance and operation of your building. His / Her responsibilities include staff supervision, contractor supervision, janitorial maintenance, preventive maintenance, repairs and building services. He or she will respond promptly and courteously to your requests or complaints regarding service and/or maintenance. Attend Emergency situations such as fires or floods, etc. Change your garbage bins, and check your boilers. Do minor repairs and call service contracts, as required. We can ensure you a smooth transition, when your Superintendent is on vacation, off duty or anytime the need arises! BiView is more than a Maintenance and Cleaning Company. We provide many services that you, as a Property Manager or Superintendent, may require from time to time. Having problems cleaning up after your tenants have moved? Need to follow real estate cleaning standards? Whether the job is large or small, we come to your rescue! Improving the appearance and appeal of your house or condo unit can be both enjoyable and affordable. A simple change of space can greatly benefit your property’s current market value. We offer interior and exterior painting, pressure washing, wood repairs, plastering, drywall repairs, carpet and vinyl installation/cleaning, replace/repair cabinets and countertops, installation of doors – any size, including fire access doors. Remember, when your tenants leave their premises in a very undesirable state, we can help! Our reputation is based on high quality products, expert workmanship and an honest assessment of your needs! BiView has the expertise to service older buildings that may need the attention. Mould can damage the appearance and structure of your property. More importantly, mould can be harmful to your health. We have the expertise and experience to remove mould. We will also prescribe a preventative maintenance plan suitable for your situation. Does your building still have walls covered in lead paint? BiView has experience working with and around Lead. Whether it is cleaning the lead from the Firing Ranges at Police Departments, or removing Lead Paint from an older building, we have the experience to put your mind at ease. Be assured, BiView workers have the knowledge and the proper attire required when working around potentially dangerous items such as Lead and Asbestos. Remember. When it’s time to bring your building up to modern standards we can help! Our reputation is based on high quality products, expert workmanship and an honest assessment of your needs! After construction of a building or complex, post construction clean up is essential. BiView is the company called upon to deliver this kind of detail work. Removal of cement, tar, and glue from floors and carpets. Stain Removal from floors, carpets, furniture and appliances. Disposal of post construction wastes. Clean windows, walls and doors covered in dust and debris. Sweep, wash and polish all hard surfaced floors. Floor tiles stripped, sealed and waxed. Pressure-wash exterior entrances and exterior walls surrounding the entrances, including parking lots. If you need post construction debris removed, call BiView immediately. We guarantee all service will be done in a timely manner and with exceptional care. Brilliant is a word that comes to mind at the sight of a bright, polished, well-maintained floor. Brilliant is the same word that characterizes floor surfaces professionally serviced by BiView. Did you know that using the wrong chemicals to clean or strip a floor can badly damage its surface? Also, it is just as harmful if an unsuitable finish is used. Whether you have chosen wood, marble, stone, granite, ceramic, terrazzo, quarry tiles, vinyl, or slate for your floors, BiView can design the appropriate service program for you! We can grind, sand, and restore floor surfaces to its natural appearance. Add more shine to its appearance and appeals. We have the technology to change your slippery floor to an absolutely non-slippery brilliant floor. In order to prevent further damage caused by inexperienced and/or negligent maintenance personnel, contact us today! We can restore your floor surfaces to its natural exquisite presentation! If you’ve had the misfortune of a flood or fire in your home or facility, you know the importance of fast action. A quick response is important to minimize damage to your property. The sooner it is returned to its pre-flood condition the less disruption to your life. BiView offers emergency water/fire damage service to get you back to normal in the shortest possible time. We are ready to respond to your crisis any time that need arises. Our immediate response team will assess the situation and are capable to assist you in any of your emergency needs. In the event of an emergency or disaster, it is important to have a reliable source that you can count on. Our staff has years of experience with insurance, water/fire damage, mould remediation and disaster recovery. We are members of the IICRC and we carry the WHMIS certification. Even if you are not working with an insurance company, we still can provide the utmost pricing in the industry for the services that you need. We will endeavour to give you the best of quality, the fastest time at a very competitive price. BiView can satisfy all your grounds care and landscaping needs. 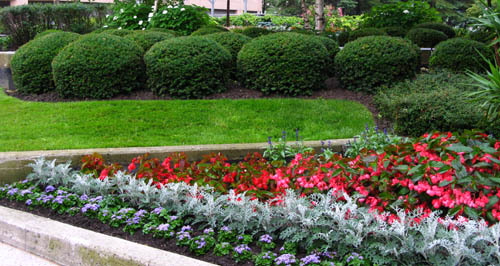 Our highly trained staff are experts in landscape maintenance, site enhancement, tree and lawn care. Our proven, systematic approach ensures you will enjoy quality service every time. Spring, fall and general cleanups include removal and disposal of dead tree, bad soil, etc. No matter what landscaping needs are, you can count on BiView.